How Are You, Foreign Students? Year by year, Kookmin University is gaining students from all over the world. However, this phenomenon is happening so suddenly and quickly that there seems to be some flaws in the procedure. 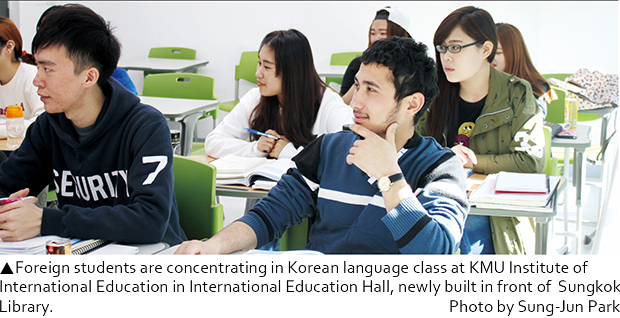 Most foreign students are having difficulty adapting to Kookmin University and Korean culture. Therefore, The Kookmin Review interviewed foreign students currently attending Kookmin University to find out what kind of campus life they have. "We need to understand each other's cultural differences." Every country has different culture. Even the countries that are similar to each other have many distinguishable aspects. The one cultural aspect of Korea that is difficult for almost all foreign students is respecting their elders. According to one Chinese student, Won-Hee Kim from the Department of English Language and Literature, she had difficulty getting used to using the honorific forms of Korean to elders. She said, “Though I learned how to speak Korean back in Shanghai, I never learned how to treat elders differently.” Similarly, one French student, Nils German from the Department of Visual Communication Design said, “the way of treating professors is very different from that of France.” Other French students from Department of Design mentioned that they felt a little irritated by the fact that some professors wanted students to respect them but didn’t seem to respect them in return. Another cultural difference they mentioned was the way of greeting others. According to them, greeting in France is done by shaking hands and kissing cheeks. This difference in greeting others was difficult for them to get used to at school. In the case of the Korean students, an orientation was given before the students started their first year of school. However, none of the foreign students received any orientation to help them understand the school and Korean culture. 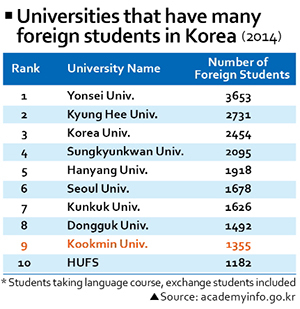 To help foreign students do well in school, Kookmin University should make a proper, separate orientation for foreign students as well. "Don't hesitate to talk to us." Making friends is difficult for everybody; however, it is twice as difficult for foreign students. One of the Mongolian students said, “The outlook of Korean students is very different from ours. Though we may be different, I just want Korean students to understand our difference.” In addition, one French student, Pauline Vidal from the Department of Design said “I know they can speak English, but they are just simply too shy to talk in English.” According to Won-Hee Kim, there is no chance for Chinese students to make friends with Korean students. This is because China’s first semester is in September while Korea starts the spring semester in March. Therefore, it seems hard for her to make friends with Korean students because they have already made friends with each other in the first semester. However, once foreign students have made friends with Korean students, they have been helpful to the foreign students. Nils German from France was able to make friends because he joined the school band. His friends from band were a huge help to him at school. One of the most difficult problems the foreign students are having is language. Even though some have pre-learned Korean before coming to Korea, they realized that actual Korean is different. A Chinese student, Sou Nam Duo Jie from the Department of Construction Engineering said “real-life Korean language is very different from what I learned from the book.” This kind of language adversity causes communication problems. According to three French students; Charles Terpraut, Thedore Bertin, Pauline Vidal from the Department of Design, language brings miscommunication especially during class or while doing school projects. Although some Korean students try to explain what the project is about in English, sometimes there are incorrect interpretations that lead to misunderstandings. For foreign students, language is the number one obstacle that they need to overcome with all their effort. Most foreign students are content with their classes. This can be a surprise because even with some language difficulties, they are able to enjoy what they learn. Two Russian students, Alexandra and Anastasiya, from the Department of Korean Language said that they are actually “satisfied” with the classes. However, some Mongolian students are having a hard time with their professors. In the case of attendance and grade, no matter how hard they try, they feel that they are receiving some unfair treatment compared to other foreign students. According to Mongolian students, some professors tend to think less of them; however, they are afraid to talk about this because of the possible consequences from their complaints. In response to the difficulties that many foreign students experience, Kookmin University has tried to help them. They came up with a program called ‘Global Buddy.’ In this program, Korean students become friends with designated foreign students to help them with school life. However, not many foreign students know about this program. Therefore, they cannot receive help because they have not registered for it. To solve this problem, this program should be properly advertised to the foreign students. In addition, Kookmin University has an International Affairs Team that is available to all foreign students. Whenever they are having difficulties in school, they can always come to the International Affairs Team’s counseling center in International Education Hall. There is a lot of help available for foreign students to receive. In order to improve Kookmin University, we the students have to understand each other. We should help each other out. We are not different. We are the same Kookminians! How About KMU Master’s Program?